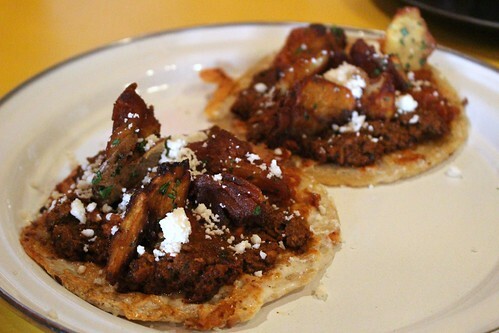 Housemade bologna with escabeche or the Chorizo and Papas ($8 for 2) are other great options. 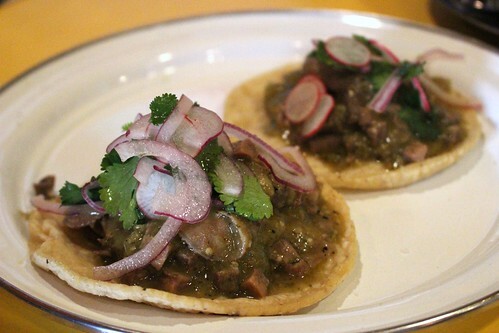 On top of tacos, B.S. 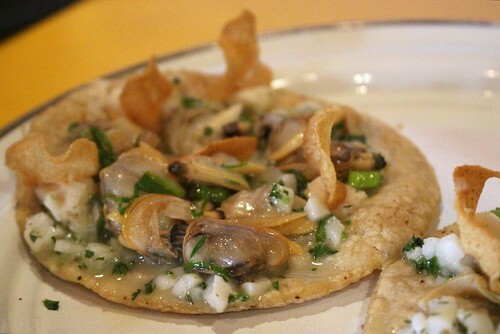 Taqueria offers other great dishes like campechana (seafood cocktail) and fun appetizers. 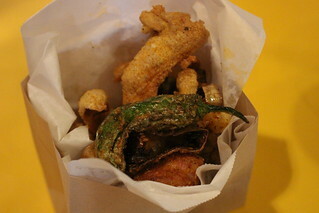 I tried the Lemon pepper chicken chicharrones (chicken skin, chicken oysters, lemon, shishito, $6). Fried chicken oysters! Other than the food, I'm loving the cocktails here. 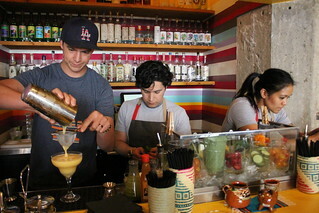 They're some of the most unique and fun cocktails I've tried in LA lately. The cocktails are inspired by things Chef Garcia remembered from childhood and the bar team (headed by Julian Cox and Nick Meyer) has taken it and ran with it. 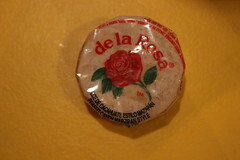 This cocktail is named and inspired by a Mexican peanut marzipan candy called de la Rosa, and it was a really unique cocktail. It smells wonderfully of peanuts, but tasted refreshing and citrusy. 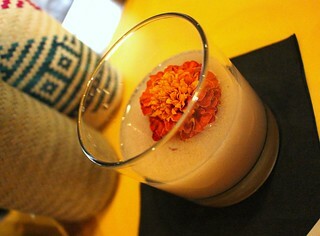 The drink is garnished with marigold, which is edible. Do try it after you finish the cocktail - when the flower has soaked up all the liquid it could, it had an interesting texture. Even in LA I don't see hoja santa often, so it was intriguing to see it muddled in this cocktail. 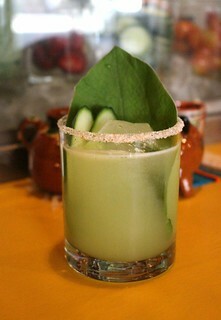 On its own, the hoja santa (the cocktail) is on the sweeter side, but when drank with the shrimp salt rim, it balanced out nicely. This is a nice cocktail for someone like me who's intrigued by savory components but don't want it as thick and savory as a Bloody Mary. 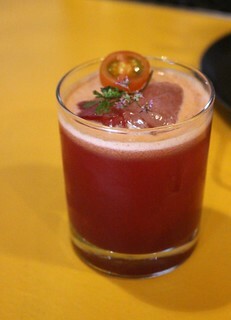 Light, refreshing, lightly sweet with the vegetal components from the tomatoes, cilantro, and beet. 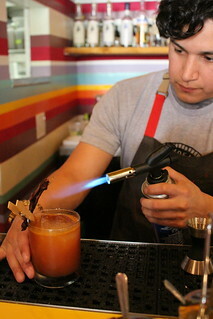 Mole Rojo (tequila reposado, red mole grenadine, lime, ancho reyes, $12). 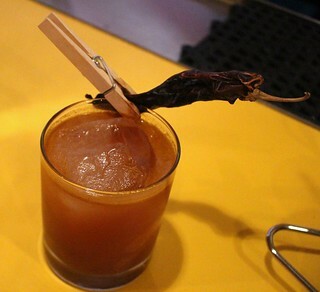 It's garnished with burnt chile on a clothes pin. They've made grenadine using the red mole paste that they bought at an East LA mercado and then strained it (the original infusion was quite thick). 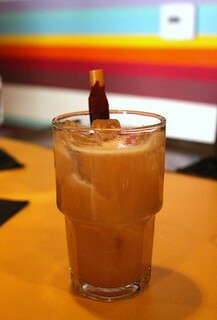 The Tamarindo combines vodka, Amontillado sherry, tamarind syrup, bitters, soda, and a tamarind candy straw. I'm glad to see tamarind cocktails that is not a tamarind margarita - the sherry and bitters work nicely here to temper the tartness. What's there to say? 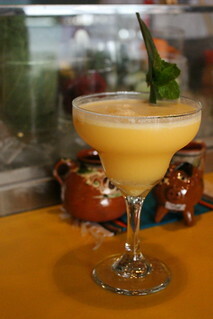 We all love Orange Bang, and this one has mezcal in it!